People often feel a chill run down their spine when the word “sensitivity” is associated with dental problems. It is a frustrating feeling and one that does not prove to be desirable. However, there are two types of sensitivity when it comes to dental health, with one being sensitive teeth and the other being sensitive gums. Here is more on both, in order to see how they differ. Gum sensitivity is based in the gums and is something one will notice as soon as they press against the gums using their tongue or finger. There are variances when it pertains to how severe one’s gum can be. For a more detailed account, you might have to schedule a visit to your dentist so he can perform a closer inspection. Gum disease or periodontal disease is one of the leading causes of sensitive gums. It begins to instigate inflammation in the gums, leading to an unpleasant feeling while one is eating or drinking. Depending on the severity, the sensitivity can also vary. The underlying cause for most gum sensitivity is going to stem from poor oral hygiene. If a person isn’t brushing their teeth or flossing as much as they need to, this issue can start to creep up and cause problems. Another dental problem people tend to notice is tooth sensitivity. The nerves attached to the tooth can start to get inflamed, and this sends bursts of neurons up to the brain. Therefore, resulting in pain in the teeth, that can often be mistaken as pain in the gums. There are many causes for sensitive teeth, and it is important to have them looked into as soon as possible before they worsen. The primary reason involves cavities and tooth fractures. This is how the nerve endings get exposed, and the sensitivity can start to worsen. If the enamel is starting to wear down, the nerve endings are going to get exposed, and that is where sensitive teeth become a reality. It is important not to brush hard to worsen this issue. If a person’s gums are receding, it is the teeth that can take a hammering. The further this recession goes, the worse one’s sensitivity becomes. This is a reality for those who have had dental work and might not be aware of a loose filling. It is important to have the filling worked on as the sensitivity will remain until that is done. 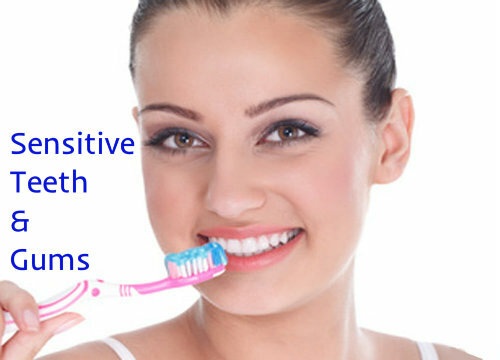 It is important to brush your teeth at least twice a day (morning and night) while using a soft brush. Don’t use a hard brush as it will worsen your enamel. Are you flossing? This is key because a lot of bacteria can start to nestle itself in between your teeth and that can do real damage. If you feel your teeth and gums are already too sensitive for string floss, try some of the water flossers that we have reviewed here. What are you eating on a regular basis? If you are consuming sugary foods or coffee, you are going to do damage to your teeth/gums. This is the difference between sensitive gums and sensitive teeth.